Building an outdoor space to comfortably contain pet rabbits is not a difficult task, but it can be time-consuming. You can build a rabbit pen in a yard of any size to accommodate varying numbers of bunnies. Choose a location for the pen. Domesticated rabbits cannot withstand constant temperatures above 78 degrees, so a shaded location is best in areas with warmer climates. After choosing the location, decide how big the pen will be. 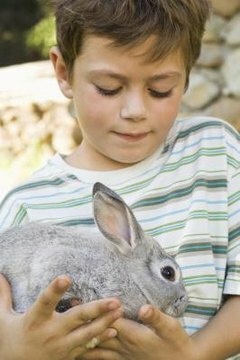 A width of at least 2 feet is suggested for one small to medium rabbit, and 3 feet for breeds considered large or giant. The rabbit should have room to stretch his body out fully in any direction -- you'd be surprised how long that can be. The pen's length should be a minimum length of 6 feet for a single rabbit, which gives him the ability to take three or four hops before reaching the opposite end. Finalize the pen's shape. Pound the stakes into the ground to create the outer edge of the pen. The stakes should be 3 to 5 inches deep to provide maximum anchorage. For a simple shape like a square or rectangle, placing stakes just in the corners will suffice; for larger pens, you may need stakes along the perimeter. You'll staple fencing wire to these stakes; the more stakes you use the more stable the fencing will be. Measure the perimeter of the pen by finding the distance between each stake and adding the numbers. Add 2 to this figure. The sum equates to the length of galvanized wire mesh necessary to surround the pen. Cut the wire fencing accordingly. The extra 2 inches is overlap. Starting at the first stake, zip-tie the end of the wire to it, and begin pulling the wire roll around the outsides of the other stakes. Ensure that the wire touches the ground. Pull the wire tight against each stake, and use a zip tie to secure. The rigidity of the wire provides protection to the rabbits inside the pen. After the whole frame has been attached, use more zip ties to attach the wire from ground to top. There should be no more than a 3-inch gap between zip ties to ensure that the rabbits cannot slip through. Secure the other end of the wire to the first pole, allowing the 2 extra inches to provide an overlap in the wire and an added security measure. Lay the chicken wire over the top of the pen and cut it to shape. This will become the floor of the pen and will keep the bunnies from being able to dig their way out. If two pieces are necessary to cover the entire floor, use zip ties at 2-inch intervals to close the seam. Push the chicken wire down into the pen until it is flat against the ground. Attach it to the bottom of the pen's wall mesh with more zip ties, again ensuring no gap is large enough for a bunny to escape through. Make a removable top to the bunny pen by repeating the steps you used to create the floor, but add an inch on each side. Instead of using zip ties that will have to be replaced to secure the edges, attach the top using twine or rope for easy access. The extra measurement of wire provides a way to lift the edge of the roof when moving it onto or off the pen. Spread straw or hay onto the floor of the pen, completely covering the chicken wire. Not only does this keep the rabbits from injuring themselves on the wire, but it gives them something to dig into and hide under if they choose. You can easily change it out when it becomes dirty. Add toys, food dishes and something for the rabbits to hide under, if desired.  Check on rabbits often, especially during the hot and sunny months.  The bigger the pen the better. Rabbits will be most comfortable when they have a good deal of room to explore.  Providing a shelter of some sort -- a plastic or wooden box -- inside the pen gives the rabbits a place to hide and a shelter from rain.  Place a piece of plywood on top of the roof wire to create additional shade for an outdoor pen.  You can easily move the pen by reversing the steps you used to build it, then reassembling. ⚠ Make sure the walls of the pen are rigid -- predators could gain access to the pen through a weak point. ⚠ Never leave rabbits unattended for longer than a day. Even though they are outdoors, they still need hay, food and water at all times. ⚠ Always put the top on the pen. If you don't, some rabbits may be able to jump over the walls, and predators can get in, too. ⚠ Check the pen often for rotting in the wood and rusting on the metal of the wire. Miami University: Rabbits: Why an Indoor Bunny?